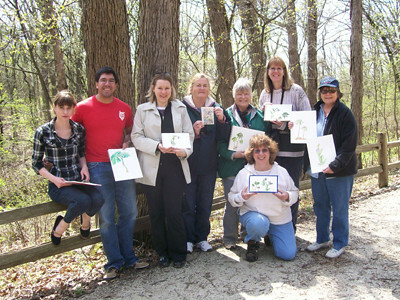 Sketch Class Results April 2011 – Let's Paint Nature! 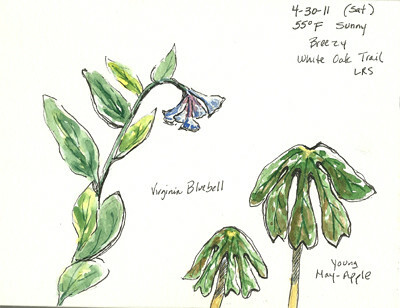 Finally blessed with a perfect warm day to do some watercolor sketching, the group headed out on the White Oak Trail in search for woodland wildflowers…and oh boy, did we find a treasure of them! 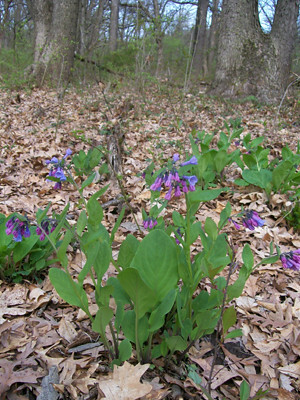 Mesmerized by the blue-violet glow of the bluebells, the group decided to study these wildflowers. 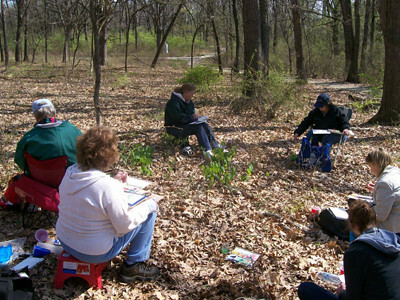 As we sat on the forest floor painting, the birds above sang, providing music for our enjoyment. Meanwhile, the wind roars through the trees giving a mighty sound and the trees respond with a sway. 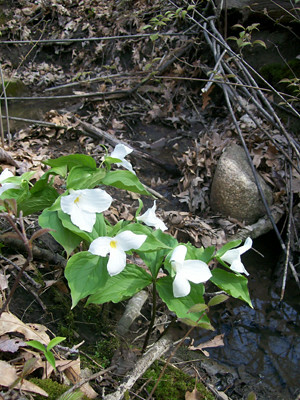 This huge white trillium was found off trail next to the stream. We also found bloodroot, spring beauty (white and pink), toothwort, may-apple, squill, yellow-violet, and some immature jack-in-the-pulpits. Here is my watercolor and micron sketch. It was amazing to see all of the beautiful artwork from the group. I’m sorry I didn’t take a photo of more art. Each person had a unique interpretation of what they saw and it was just outstanding! I thank all of the students for showing up and making class a very memorable event. I had such a great time and all of the artwork was amazing! I went to the Morton Arboretum yesterday and saw an entired field of Virginia bluebells then went to The Growning Place in Naperville and purchased two pots to plant in my backyard as a reminder of what a wonderful Saturday this was! I hope I see all of you this month but don’t know if I will be able to make it in time after driving home from Door County that morning – otherwise — see you on July 30th! Alanna: What a wonderful idea, to buy some bluebells! The Morton Arboretum is a nature wonderland. Have fun in Wisconsin….take me with…pleeeeaseee….